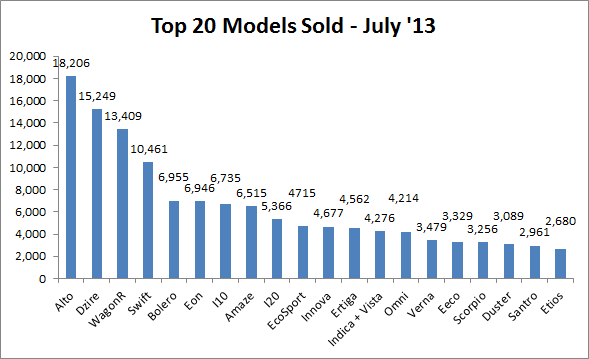 July 2013 - Here we witness Ninth month, straight in line with a downturn for the Indian Automobile Industry. July being a month with rains and an inauspicious month for taking any financial decision, Automobile Industry was one hit the most. Though, Lot of changes though in top 20 rankings viz-a-viz June 2013. July 2013 could also be termed as a "One Man show" for many of the automakers - EcoSport for Ford, Amaze for Honda and Duster for Renault. Interestingly, Ford's EcoSport moving ahead of Renault's Duster right from first full month of sale (neglecting the launch month - launched in June 2013). as we reported to you couple of times, Ford's EcoSport though priced higher than Renault Duster in Brazil was still reporting higher numbers consecutively for months and is still doing. The trend has already started in India and let's see how far does it goes. Also, there were lot of surprises that the month of July brought. The homegrown, largest SUV maker which registered a growth of 35 percent last year is now going through a tough time. The sales of Quanto, Bolero, Xylo and XUV 5OO have plummeted to a life time down sales. Even Rexton is down to one-fourth of its usual numbers. Vibe, despite of being a unique segment in itself is still a flop show. So, safely we could say the only model selling for Mahindra now is its oldest SUV Scorpio.